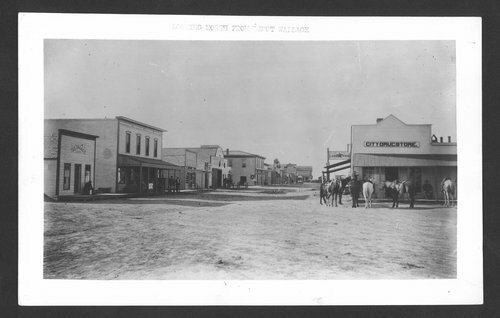 This photograph shows a view of business buildings on a street looking north from the depot in Wallace, Kansas. The City Drug Store is visible in the right foreground. A building farther back on the left side of the street, near the center of the picture, has a sign reading, "Druggist." Several other buildings are visible along the street. A few men are visible outside of some of the buildings, and two carriages and several horses are also visible along the street. Holding Institution: R. T. Brock, 1939.